The place of women in the redemptive community. I was saddened and disappointed in your remarks," one of my readers wrote me, "and I pray that you might reconsider your position in the light of the glory of God." Another reader lamented, "I do have grave concerns with your statements on this issue." A third demanded, "Has God said, or not?" Just so you know, I haven't come out against the Trinity or the bodily resurrection. 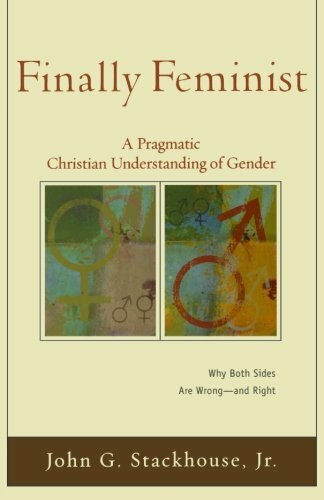 I remarked on my blog how much I liked John Stackhouse's new book Finally Feminist: A Pragmatic Christian Understanding of Gender. This fairly mild pronouncement got highlighted on Gender-News.com, which published a headline story announcing that "many evangelicals may have been blindsided" by my blog entry, and quoted Randy Stinson of the Council on Biblical Manhood and Womanhood as saying, "She is undermining biblical authority by holding her current position on the gender issue." On the Reformation 21 blog, a poster wrote that my approving citation of Stackhouse's book shows that I have taken a position "in knowing contradiction to the teaching of the Bible; at that point the earth begins to give way." "If you have benefited from Susan Wise Bauer's books," another blogger begged, "I hope you will consider writing to her and expressing your concern about this public declaration… . This pronouncement could be confusing at the least … and destructive at the worst." No wonder Stackhouse sounds so weary in the preface to Finally Feminist. "Aren't we 'done' with gender?" he begins. "Haven't all the relevant issues been raised, all the texts scrutinized, all the alternatives arrayed?" Well, yes. But if my blog post can whip up that much anxiety, we're obviously not "done" with gender yet.